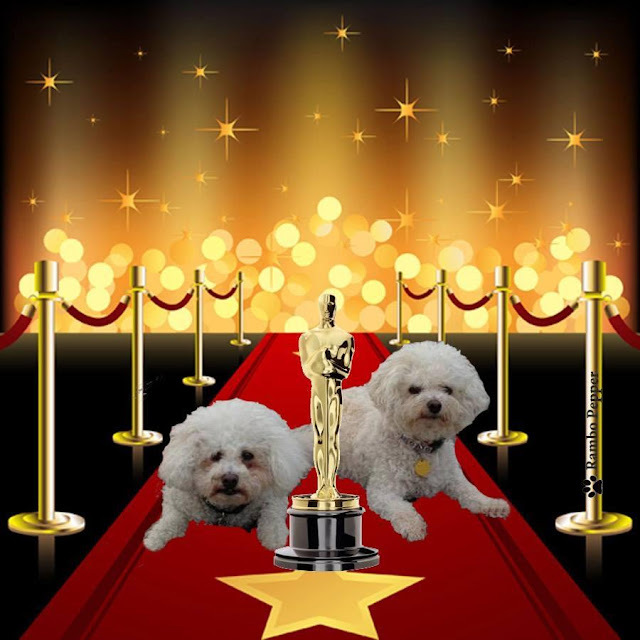 bichonpawz: Academy Awards and Catch Up! Academy Awards and Catch Up! The awards themselves have gotten a little bit TOO political for my taste as I keep my personal views on politics to myself and do not appreciate the actors getting up on stage and throwing all of their opinions at me...regardless of whether anyone cares or not. In other news, I have just been swamped here with lots of "stuff" going on. Trying to get my act together to get packed for the trip south. I have an entire room full of things I took out of the RV when we sold it. Now I have to decide where to put it all. Much of it was going to be moved to the cottage, but I don't have a ton of extra storage room up there. It is only about 1000 square feet. So, some of it may have to be sold. Just having to sort through it all takes time. My oral surgery went well...I truly appreciate the surgeon who I go to. Now, big decisions have to be made on next steps. My regular dentist retired so I have to figure out who I will go to now. I am always a little bit nervous starting out with someone new. I am anxious about it because the other two bridges in my mouth were all put in during the same timeframe...about 34 years ago. I am thinking that they may all be in need of replacing. That can mean some serious money. Chloe seems to be aging by the day. There are just little changes we are noticing. She cannot hear or see much anymore and she just seems to be kind of uncomfortable. I think she is suffering from arthritis...much like our big guy did as he aged. I am very worried about how she will do on our road trip. The vet has given her a prescription but it does not seem to have much effect on her. We are probably going to have to stop about every two hours. That's it for now folks. My apologies for not being around much. I will certainly try to get back in to the groove again! Okie Dokie I had the courage to read that the oral surgery went well. My dentist has decided to work just part time but his partner is young and I like him ~ yep dentist and gyn I hate finding new doctors. So about Chloe it is sad watching them age, I wonder if they notice us ageing. You have a lot going on. Hope your dental work goes well and give your sweet Chloe a hug from me. I want their autograph! Woof! I promise you a recap of my favorite best / worst dressed! We will have to compare notes to see if we agree on Best and Worst Dressed! Thanks Phenny! It's pretty tough watching our loved furry family members as they age...we love them and hug them all we can for as long as we can. That is all we can do. We sincerely appreciate the POTP and the hugs! I'm glad your dental surgery went well. Sending POTP to Chloe. I've had so much oral/dental work over the years and I agree it does make one anxious. All that noise so close to the brain as they drill and yank and well you know. November 2016 I had a very old bridge yanked out because there were a small cavity on one of the anchor teeth. Of course I didn't feel anything but I was sure they were going to pull out my brains. My periodontist retired in Oct 2017. I have my first appt with his replacement in May. My biggest fear is that being young he will have all these fantastic ideas.